The ‘306 patent describes a method for tracking a player during an online game. The invention can distinguish between existing and new patrons and tracks their gaming activity while they play. An electronic database is used to store the existing player’s information. Whenever a new player enters the game, a file is electronically created for him and all game updates are stored in the folder whenever a player plays any game. 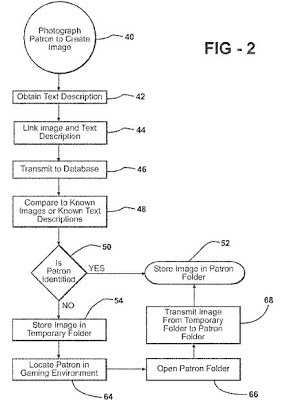 A system and method of tracking a patron in a gaming environment uses a database that stores known images and known text descriptions of existing patrons. An image of a patron is captured by an image capture device, and a text description of the patron is obtained. The image and the text description are transmitted to the database. A comparator compares the image or the text description to those on the database. The image is stored in a patron folder if the image or the text description is found to match an existing patron. The image is stored in a temporary folder if the image or the text description fails to match one of the existing patrons, and once the patron has been identified, the image is transferred from the temporary folder to the patron folder. 1. A method of tracking a patron in a gaming environment to distinguish between existing patrons and new patrons to track their gaming activities, said method utilizing at least one database having a patron folder and a temporary folder with a plurality of known images and known text descriptions stored in the patron folder, said method comprising the steps of: photographing the patron to create an image, obtaining a text description of the patron, linking the image and the text description together into an electronic communication, transmitting the electronic communication to the database, comparing at least one of the image and the text description to determine if the at least one of the image and the text description is equivalent to one of the plurality of known images and known text descriptions stored in the database, and storing at least one of the image and the text description in the temporary folder if at least one of the image is different than the known images and the text description is different than the known text descriptions stored in the database to distinguish an existing patron from a new patron and to track the gaming activities of the patron.